Fraunce is dividit intae 18 admeenistrative regions (French: régions, pronounced [ʁe.ʒjɔ̃]), 22 o whilk is in Metropolitan Fraunce, an five o which are owerseas. 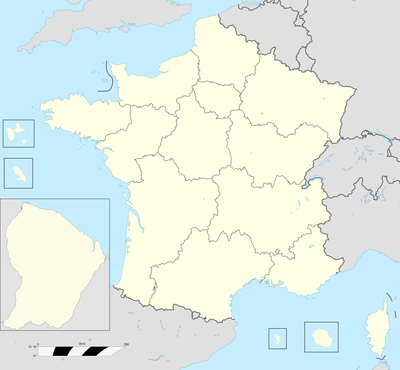 Corsica is a territorial collectivity (French collectivité territoriale), but is considered a region in mainstream uisage, an is even shawn in a siclike wey on the INSEE wabsteid. Ilka mainland region an Corsica is forder subdividit intae depairtments, rangin in nummer frae 2 tae 8 per region for the metropolitan anes whaur the owerseas regions technically conseest o anerlie ane depairtment. The term region wis offeecially creatit bi the Law o Decentralization (2 Mairch 1982), whilk gied regions thair legal status an aw. The first direct elections for regional representatives teuk place on 16 Mairch 1986. In mainland Fraunce (keepin oot Corsica), the median land aurie o a region is 25,809 km² (9,965 sq mi), that is that wee bit lairger than the U.S. state o Vermont, an 4% the median land aurie o a Canadian province, but 15% lairger than the median land aurie o a German region ("Regierungsbezirk"). In 2004, the median population o a region in continental Fraunce wis 2,329,000 indwallers, three quarters o the median population o a German Land (state), but mair nor twice the median population o a Canadian province. Regions lack separate legislative authority an syne canna write thair ain statutory law. Thay levy thair ain taxes an, in return, receive a decreasin pairt o thair budget frae the central govrenment, that gies them a portion o the taxes it levies. Thay hae considerable budgets managit bi a regional council (conseil régional) made up o representatives votit intae office in regional elections. A region's primary responsibility is tae big an furnish heich schools. In Mairch 2004, the French central govrenment unveiled a controversial plan tae transfer regulation o certaint categories o non-teaching scuil staff tae the regional authorities. Critics o this plan contendit that tax revenue wis insufficient for tae pey for the resultin costs, an that a siclike measures wad increase regional inequalities. In addition, regions hae considerable discretionary pouer ower infrastructural spendin, e.g., eddication, public transit, varsities an research, an assistance tae business awners. This haes meant that the heids o walthy regions lik Île-de-France or Rhône-Alpes can be heich-profile poseetions. Proposals tae gie regions limitit legislative autonomy hae met wi considerable resistance; ithers propose transferrin certaint pouers frae the depairtments tae thair respective regions, leavin the departments wi leemitit authority. Nummer o regions controlled bi ilka coalition syne 1986. The follaeing region haes the special status o territorial collectivity. The follaein five regions hae the special status o owerseas region. ↑ 1.0 1.1 "Carte des Régions" (in French). INSEE. Retrieved 2009-09-29. ↑ Thir flags isnae offeecial, but popularly uised. This page wis last eeditit on 6 Juin 2018, at 19:07.